@mxrissasophia hahahhaha yes!! plus .. hi new race friend. want to play emoji fight?? 04 Oct 11 copy & paste +upvote -downvote @mxrissasophia hahahhaha yes!!  plus .. hi new race friend. want to play emoji fight?? @RahmanHussin sounds fun! U shld get back to work! All the best. @LadyxFarrah I only found it cos I was adding the emoji thingys. I'm gonna take a picture dedicated to breast cancer awareness month. Calling de Seb Ingrosso & Alesso es una de mis canciones favoritas en este momento! Me pone tan de buenas! Buenos días! @mbleezy193 -- it's this app called emoji free! Just download it and it tells you what to do @HannahNorback told me about it! 04 Oct 11 copy & paste +upvote -downvote @mbleezy193 -- it's this app called emoji free! Just download it and it tells you what to do  @HannahNorback told me about it! 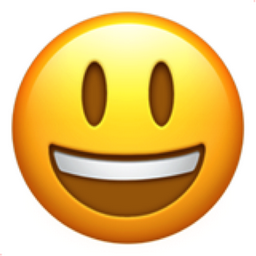 Like Smiling Face with Open Mouth Chronological Emojitweets 5?